Bishop LaTrelle Easterling, the episcopal leader of the Baltimore-Washington Conference (center), along with other members from Foundry United Methodist Church in Washington, stand in front of the United Methodist Building before the rally. Photo by Sheila George. Hundreds of thousands of people around the world marched in solidarity with a group of high school students who are saying “enough is enough” when it comes to gun violence, especially in schools. United Methodists joined in the March for Our Lives here and in many of the more than 800 locations on March 24. The marches brought together celebrities and people from all walks of life to send a message to lawmakers that gun laws need to be changed so people are safe. The rallies were led by students from Marjory Stoneman Douglas High School in Parkland, Florida, where 17 people died in a mass shooting in February. United Methodists and other faith leaders lent their voices and feet to the cause. Gathering for a prayer service at the United Methodist Building in Washington, just across the street from the United States Capitol building, leaders prayed for a safe march and encouraged people to put their prayers into action. Bishop LaTrelle Easterling, the episcopal leader of the Baltimore-Washington Conference, offered a prayer before the event and then took off in tennis shoes to join thousands of marchers. Organizers estimated 800,000 marched in Washington, although others put the crowd at 200,000. “I’m here because our conference has spoken out already about senseless gun violence and balancing the rights of our citizens with the right everyone has to life, liberty and the pursuit of happiness,” the bishop said in an interview. She said it was time to offer action as well as thoughts and prayers. The bishop urged United Methodists who couldn’t attend an event near them to register to vote and vote in the next elections. Hannah Beamish came to the lock-in at National United Methodist Church in Washington, March 23 with her youth group. Photo by Erik Alsgaard. 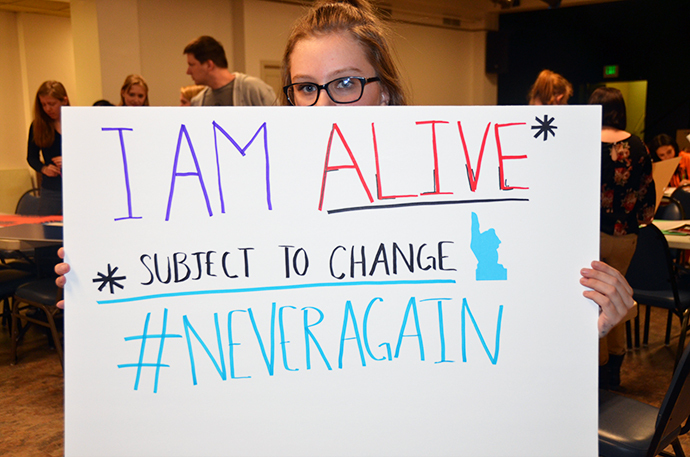 United Methodist churches in Washington fed and housed youth groups who came for the March for Our Lives rally against gun violence. “We (adults) should have been leading this, but we had to wait for them to lift their voice,” she said as she choked back tears. However, she added, witnessing the young people at this moment in history gives her a sense of hope. Hannah Beamish, an 11th grader from Rochester, New York, and a member of Asbury First United Methodist Church there, came with her youth group. Jeania Ree Moore, the director for Civil and Human Rights at the United Methodist Board of Church and Society, said the denomination’s position on gun violence reflects its position on violence in general. Signs at the March for Our Lives in Washington March 24 send the message that gun laws need to be changed so that people are safe. United Methodists and other faith leaders lent their voices and feet to the cause. Photo by Erik Alsgaard. Moore said she hoped that people would realize the work doesn’t stop when the rally stops. “But this day will not solve it; there is needed work on legislation, on community organizing, intervening in violence and putting down the weapons of war,” she said. The board has a host of resources on gun violence, Moore said, including Bible studies, worship resources, and more. A large youth contingent from Emory United Methodist Church in Washington, also marched. The Rev. Joe Daniels (starting left to right), Emory United Methodist Church in Washington, Jeania Ree Moore, the director for Civil and Human Rights at the United Methodist Board of Church and Society, Sharon Milton, Youth Director at Emory United Methodist Church in Washington, and the Rev. Johnsie Cogman, pastor at Mt. Zion United Methodist Church in Georgetown. Photo by Erik Alsgaard. Beth Scott, a member of Foundry United Methodist Church in Washington, stands on a street corner across the street from Union Station, trying to get people to register to vote during the March for Our Lives, March 24. Photo by Erik Alsgaard. He said witnessing the leadership of the students from Parkland, and other youth, gives him hope. The Rev. Martha E. Vink, who serves the NOW Cooperative Parish in and around Carmel, New York, said she was inspired to come by the young people. “I feel like they are the spark that is setting us all on fire in a new way,” said Vink, who planned to drive back after the march for Palm Sunday at her church. “As a person of faith and a follower of Jesus, I have to speak this message of peace. That’s what I’m about; that’s what we’re all supposed to be about. It’s time for us to stand up and say so,” she said. The Rev. Johnsie Cogman, who serves the oldest African-American congregation in the District of Columbia area, Mt. Zion United Methodist Church in Georgetown, brought youth and several members of her confirmation class to the rally. The United Methodist Church’s Book of Resolutions includes a lengthy statementon gun violence which calls for background checks and waiting periods for gun purchases. It also calls on the church to advocate for the eventual reduction of the availability of guns. “Guns have been killing our children left and right. I’m so impressed with how our young people have risen to the occasion. If they can stand up for their rights, I think we can stand up with them,” Cogsman said. Being in the African-American community, Cogman said, she hears about gun violence all the time. She knows that her kids do, too. Beth Scott, a member at Foundry United Methodist Church in Washington, stood on a busy corner across the street from Union Station for several hours, asking passersby if they were registered to vote. “I support voter registration and having the ability of people to have their voices heard,” she said. Scott was volunteering with Head Count, which in turn was partnering with March for Our Lives. Scott said it was important to put faith into action. Alsgaard is managing editor in the Ministry of Communications for the Baltimore-Washington Conference. To get more United Methodist news, subscribe to the free Daily or Weekly Digests. News contact: Vicki Brown, 615-742-5472 or newsdesk@umcom.org. More than 50 women, representing diverse experiences and roles, gain knowledge to reduce vulnerability to violence and discrimination in a patriarchal society. As part of its five-year strategic plan, United Methodist Women aims to help women and girls by providing safe homes, counseling, legal and medical services, education and other aid. United Methodists are mourning bank shooting victim Marisol Lopez, a prominent member of her Florida congregation.